HD Auctions is a class-setting designer of custom eBay Motors templates. Having a unique, powerful and beautiful eBay presentation will captivate your audience and increase bids. Most of us know the power of eBay, but many can underestimate the power of presentation. Excellent photography coupled with an outstanding presentation will give your dealership an edge that should not be underestimated. Professional presentations show buyers you are sophisticated, web-savvy, and more trustworthy. This all adds up to increased bids and market share. 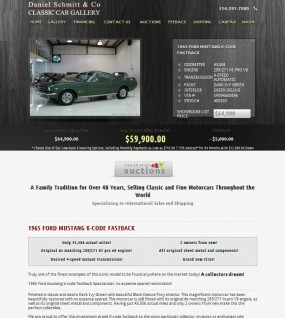 HD Auctions provides the most sophisticated eBay Motors templates on the market. Our team of expert web designers, graphics designers and former dealers work in tandem to formulate an unrivaled product. During the template customization process we will review your current template, website and overall dealership feel; then have our designers produce the template you always dreamed of. This process can take several days, but it’s well worth the wait. Choose one of our existing templates and we will customize it. Includes logo integration, custom headings, custom pre-hosted graphics, custom installed fonts, and of course a brand new custom description generator that is unique to your template. Your description generator inserts all the text and images inside your template exactly where they need to go, then generates the eBay HTML code that you insert into eBay’s description field. Includes 1 year premium HD Auctions membership. Pricing: $795 $495 -Special limited time offer! Fully customized template from scratch. We can match your template to your current website design or engineer a totally new and unique design. Includes logo integration, custom headings, custom pre-hosted graphics, custom installed fonts, and of course a brand new custom description generator that is unique to your template. Your description generator inserts all the text and images inside your template exactly where they need to go, then generates the eBay HTML code that you will insert into eBay’s description field. Includes 1 year premium HD Auctions membership. Pricing: $1695 $795 – Special limited-time offer! If you wish to modify the HTML yourself you may do so via “CSS”, which is like a master design switch. Instantly modify all key designs of the template (font size, font color, background colors, etc) with just a few keystrokes, making customization super easy and fast. This is the newer sleeker version of HTML that downloads quicker and displays better on every computer. This ensures your template fonts appears exactly the same for everyone. Our template magically “stretch” when a user view it on a widescreen display and “shrinks to fit” to mobile and portable devices. If you use a stationary email like Outlook or Thunderbird simply copy and paste the HTML into your email and send the ad to customers. Just enter your own text, hosted vehicle images and your done. Of course all of our templates are eBay, Web 2.0, and WC3 compliant.